In today's world a website has to operate and look well on more diverse devices than ever before. The Web-Design-Industry buzzwords for this are mobile-friendly or responsive design. While a couple of years back a website was a more or less static affair, with images stuffed into a pixel-fine defined grid, the modern way of design is to look at the content first and group it into logical groups. Because the screen size of the user is not known, when designing a layout, the designer has to cater for the site looking good on tiny as well as huge screens. But the enormous advantage is, that your customers can see your message no matter what device they are using. Professional Web Solutions already adopted this design style a while ago as our default design method. In April 2015 Google has changed it's ranking algorithm to favour mobile-friendly websites. Now it is only a matter of time when sites that are not user friendly will go down. 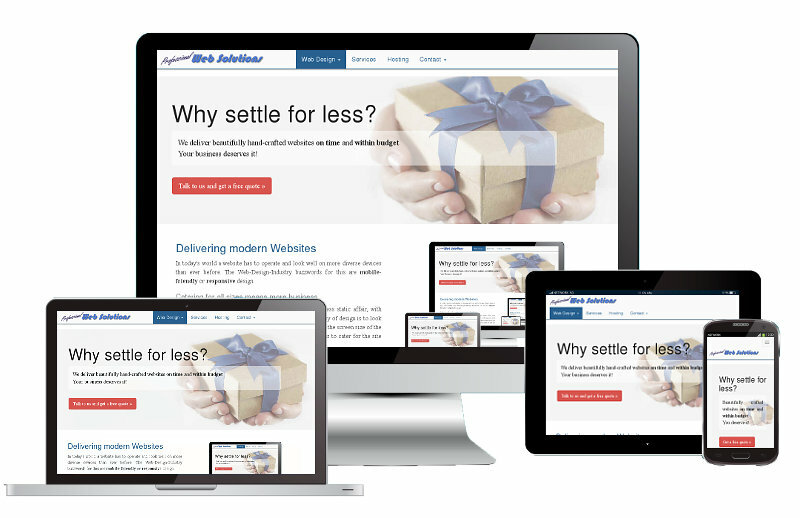 We believe, that every website can be delivered 'on-time' and in fact needs to be. A website, be it a brand new one or a 'refurbishment' will inevitably be tied into your business' marketing planning. Working with us, you can concentrate on your business, because we will make sure, that our project is ready for you when you need it. Before we start coding the first line, we will have a clearly defined roadmap of milestones. This is all settled in a contract between you and us. One of the important questions we get asked at the beginning of a project is about the "cost of a website". "How expensive is a car?" or "How long is a piece of string?" comes to mind here. A website is a very unique product tailored exactly to what you need and want. To safeguard you from the proverbial heart attack, we can provide you with an estimate to give you a ball park figure. Once you are ready to engage Professional Web Solutions we will work to a contract, that outlines clearly What you get, When it's finished and How much it costs. Maybe not an answer in dollar figures you have hoped for, but we can assure you that prices for our projects are very competitive. Talk to others, but make sure you ask us as well. There is a small but dedicated team behind Professional Web Solutions. Our focus is to serve our customers as best and efficiently as possible and we have been doing this for 21 years. Located in New Zealand's magnificent Marlborough Sounds, we specialise in serving small to medium sized enterprises.